The Four O’clock subdivision is one of the first single-family neighborhoods to be built up above town on the ski hill side of the valley. Located just below the base of Peak 8, it is common for residents to ski home from the mountain, and take the free shuttle bus to start the day or to get to town. This pioneering neighborhood was built by homeowners, one at a time, with varying architectural styles. The Four O'Clock homes for sale are made up of a couple of long, forested blocks, where each home has an independent, straight driveway and garage. 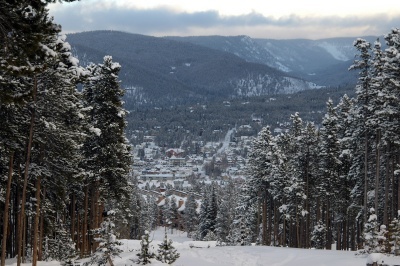 Homes in the Four O’clock neighborhood have tremendous views of the Breckenridge ski area. It's a five minute drive to the center of town from up in the Four O’clock community, and a quick downhill walk or ski down Four O’clock Run, an unpaved trail that is a groomed run, a gentle continuation of the ski slopes, in the winter. Learn more about this popular subdivision, or check out the Four O'Clock real estate listings found below. When the first Four O'Clock home was built in the subdivision in 1969, Ski Hill Road was a dirt road, and it would have been a steep climb home, by car or foot. But on a powder day, when buses weren’t running, this area is close enough to the base of Peak 8, that homeowners could have clicked into their bindings and skated to the lifts. Down the hill, closer to town, developers were building condos, and maintaining 4 O’clock run all the way to town. Gradually more homes were built in the subdivision. Ski Hill Road was paved, more condos were built and 4 O’clock Road was establish and paved, but the residents in this area kept the ski run, too. 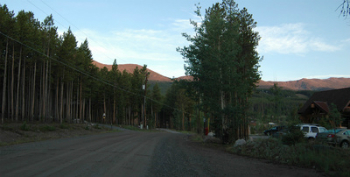 Today, this diverse neighborhood is prime property, and surrounded by newer, but similarly high-end subdivisions like Timber Trails and Boulder Ridge. Size: 1148 sq. ft. to 7267 sq. ft.
From the center of Breckenridge (main stop light on Ski Hill Road) take Ski Hill Road to CR 708, or Timber Trail Dr, turn left onto this road, then right onto Sawmill Run Rd or Four O’clock Run Rd (depending on the address. All homes in this neighborhood are on one of these two roads. Don't hesitate to contact us. An expert is waiting to answer all of your Breckenridge real estate questions!